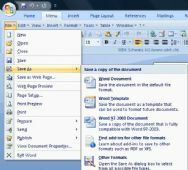 Reader Jim recently found himself face-to-face with Word 2007 for the first time, and quickly declared the "top task bar too complicated for my novice use." He's referring to what Microsoft calls "the Ribbon," and he wants to know if there's a way to simplify it. No doubt about it, the Ribbon (which appears in most Office 2007 and all Office 2010 programs) can seem daunting to anyone accustomed to earlier versions of Word, Excel, and the like. If that's you, check out UBitMenu. This free plug-in brings pull-down menus back to Office 2007 and 2010, thus easing your transition. Thankfully, it keeps the Ribbon, too, so you can learn the new interface without totally abandoning the old one. After installing UBitMenu, you'll see a new tab next to Home: the aptly named Menu. Click it and you'll find File, Edit, View, Insert, Format, and all the rest of those long-lost drop-downs. Even better, UBitMenu retains most of Office's newer features, like the more robust Save As sub-menu. You get the best of both worlds. The program is free for private, personal use. I can't recommend it highly enough.